This page contains tips and ideas on how to clean metal items. Removing Lacquer from SilverHow do you remove lacquer from silver and silver plate? Removing Excess Tile Grout from Polished Brass Shower DrainThere is excess tile grout covering my polished brass shower drain. How do I remove the grout without damaging the polished brass finish on my shower drain? Homemade Metal Polish RecipeI make one of a kind hand made, bone handle knives with blades of different types of metal. I can say they are unique. So I'm looking for a recipe to make my own homemade metal polish. Polishing Aluminum and Stainless Steel Corrosion on Classic CarI have a 1963 Chevrolet Bel Air that has aluminum trim on the grille and I believe stainless steel trim on the hood. Both these surfaces have stubborn corrosion issues. I have tried "Liberty brand metal polish, Brasso metal polish, and Blue Magic Wheel and automotive trim polish. 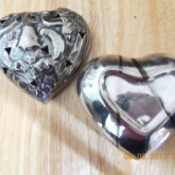 Removing a Dark Mark on Silver Lidded BowlI have a silver heartshaped bowl with lid. I put a rubberband around the bowl to keep the lid on. Now there is a mark on the lid and base. What suggestions do you have to remove the rubberband mark? Steel Wool Ruined All-Clad PanMy husband has been using steel wool pads to clean my All-Clad pan. Can it be restored or is the finish ruined? Cleaning a Copper Tea KettleIs there any way to clean my late mother's copper tea kettle? She had put it in her basement and it was dull and green tarnished. I read to soak it in vinegar which I tried, but it is still green and had a dull finish. Is there any hope of should I throw it out? Preventing Tarnished SilverWill wiping silver items with lemon oil prevent tarnishing? Sterling Silver Ring Discolored by Denture CleanerI'm so stupid. 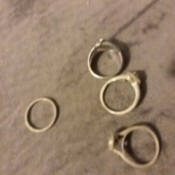 I have 4 rings all are sterling silver. I'm heartbroken. I put them in denture cleaner. I thought it would clean them good. Are they ruined" It was my mother's ring that my sons got me. my wedding set, and my Christmas present from my husband. Cleaning a Stainless Steel Slicer After a FireI am looking for tips on cleaning and restoring a Hobart stainless steel slicer that was in a severe commercial kitchen fire. It still works and the motor still runs. How do I clean stainless steel in general after a fire? Cleaning Old SilverwareI have a few pieces of old silverware. How do I clean them? Removing Pen Ink from Door HandleHow do I get pen ink off of my house door handle? Cleaning Armetele MetalwareHow do I clean tarnished Armetele? Sterling Silver Tarnished by BleachI accidentally left my sterling silver and some plated, in bleach to clean them. I forgot to get them out. After more than an hour, I went to get them and they are very tarnished. What do I need to do to restore them back to their beautiful state again? Opening a Corroded Silver Salt ShakerHow do I get the top of a silver salt shaker off? It appears to have corroded. It is several decades old. Removing Burned Grease Stain on Stainless Steel PotI burned some grease in my pot. How do you get a black burn mark out of a stainless steel pot? Cleaning Burnt Grease of the Bottom of Copper PotsWhat is the best method to clean burnt grease on the bottom of Copper Chef pots and pans? Will oven cleaner work? Cleaning CopperI immersed a yellow copper bell in a solution of warm water and tartaric acid and the copper turned red. Why and what now? Removing Permanent Marker on MetalI have permanent marker on metal bathroom stalls. How do I get it off? Cleaning Nicotine Off a Metal and Glass Lamp ShadeMy mum has given me a silver coloured metal lamp shade, but unfortunately she is a heavy smoker hence it has stains on it. I don't want to immerse it in water as it would go rusty. Any ideas? Removing Water Spots on Stainless SteelHow do I get water spots off of stainless steel? Cleaning a Discolored Aluminum Coffee PercolatorMy mom tried to clean the inside of an aluminum coffee maker with baking soda and blackened it. Is there anything that will clean the aluminum to restore it to it's original shine? Cleaning Wax Off a Brass CandelabraHow do I clean wax from a 9 stemmed brass candelabra? 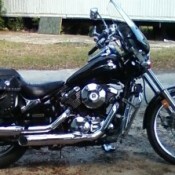 Removing Scratches on Chrome Exhaust PipesAnybody have any ideas on how to take out scratches on chrome exhaust pipes? I had to get some melted plastic off. "Easy Off" worked pretty good, but not great. WD40 Stain on Brass PlaqueWhile working on a brass USMC plaque I managed to spray some WD40 on the surface. How, pray tell, can I remove the stain it left? Tarnish Remover Left Stain on Stainless Steel SinkHow do I remove stains created by a tarnish remover used to polish silver? I laid a sponge in the sink and now I have an outline of a sponge! Cleaning Corroded Salt ShakersWhat do you use to clean corroded salt shakers? Cleaning Fire Damaged Sterling SilverWhat is the best way to clean? Cleaning the Interior of a Copper BottleI just inherited a copper water bottle. I have been surfing for cleaning tips. Can someone really advise on how to keep the exterior as well as the interior clean? How often does the interior of the bottle need to be cleaned? Cleaning Rusty Metal ShelvesI've bought some antique, not valuable but great looking, metal shelves that are quite rusty. The shelves were originally red and I'd like to keep them in their original condition, but just tidy them up a bit. I don't mind if some of the rust stays. Removing Sharpie from Old Tin LunchboxHow should I go about removing Sharpie from an old tin lunch box without removing the paint? Cleaning SilverI have a lot of silver pieces from my family. I've read here before about cleaning silverware, but don't remember anything about cleaning the larger pieces. Could someone help me with this one? The thought of cleaning them, by hand, piece by piece, is overwhelming. Cleaning Wax From Brass TableHow can I clean wax from a brass table? Cleaning Aluminum PontoonsI would like to clean the pontoons on my pontoon boat. What should I use? Keeping Silver Jewelry from TarnishingI clean my silver jewelry, store with anti tarnish strips and within a few days it is tarnished again! I make and sell jewelry so I have hundreds of pieces, what can I do? Cleaning Silver Plate Lighter Without SoakingI have a silver plated lighter which is heavily tarnished, but cannot be soaked for obvious reasons. Is there a homemade polish or cleaner that I can make which can be rubbed on similar to brass cleaner or wax polish? Label Adhesive on Metal SurfaceHow can I remove left over label adhesive? I have washed in hot water, gently scrapped, and used rubbing alcohol. What do I do? Cleaning SilverIs there an easy or homemade way to clean silver and where do you suggest to sell for the most honest price? I have sold at jewelry stores in past, but that was over 15 years ago. Polishing Aluminum PotsMy aluminum pots are very dark. What can I use to restore the original color? My pots are over 40 years old. Is there an aluminum polish? Removing a Stain on a Brass TableI have a stain on my brass table. It looks like a cup ring. How do I remove it? Cleaning Antique Sterling SilverI have a collection of sterling silver napkin rings, which are almost all 100 plus years old. Most have intricate designs in the Art Nouveau style. I have used the aluminum foil/baking soda and salt in hot water method. However, I now have a cloudy white residue left in the creases and indentations of the Repousse Nouveau designs. Cleaner for Stainless Steel SinkI need a thrifty cleaner for stainless steel sinks. Can you help me? Removing Coffee Stains from Stainless SteelHow do I remove coffee stains from the inside of a Cuisinart stainless steel insulated coffee pot? Nothing seems to be working and now it is very dark. Cleaning an Aluminum BoatWhat cleaning fluids would clean a 14 foot aluminum boat? Cleaning Silver and SilverplateWhat is best way to clean silver and silverplate? Cleaning BrassA friend and I have been trying to find the easiest way to clean brass with no results. It is not copper, but brass. Thank you. Cleaning an Aluminium Coffee PotHow can I clean an aluminum coffee pot (hob type). The inside has coffee stains and it smells awful. Cleaning Brass Around Shower StallsHow do you clean the brass around a shower stall? Removing Candle Wax from MenorahHow can I get candle wax off of a metal menorah? Cleaning BrassCan anyone tell me about using potash as a cleaner for tarnished brass? Removing Lacquer from SilverHow do I remove old lacquer from silver? 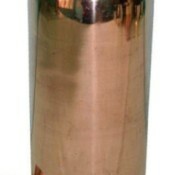 Homemade Brass CleanerI have 100 pieces of brass to clean. I'm looking for a solution I can make so this project won't take forever. I would like to be able to soak the smaller pieces and then polish. Cleaning PewterHow do I clean pewter? I have pewter salt/pepper shakers. They are really pretty, but in a short time using them, the pewter discolored on the salt shaker. I guess pewter and salt do not mix? I know that sounds silly, but I think pewter cannot be used as a salt shaker? Best Silver CleanerWhere can I get a reliable cleaner that will not etch/damage the original surface? Or how can I make a safe cleaner? Homemade Brass PolishWhat is a simple recipe for a brass cleaner for trays, candlesticks, boxes, etc.? Thanks. Removing Candle Wax on BrassWhat is the best way to clean brass? I think I have candle wax on the bottom of the stand. What is the best way to remove it? Rubbing Alcohol Left Stain on Bathroom FaucetMy daughter spilled rubbing alcohol on our new bathroom faucet. It left a milky looking stain. Any way to remove this? Removing Metallic Taste from Stainless Steel CarafeHow do I get the metallic taste out of a stainless steel carafe? Cleaning Stainless Steel Sink With Baking SodaWill baking soda mixed with vinegar scratch a stainless steel sink, if used for cleaning? Cleaning Old CoinsI have a bunch of old coins that have been in a fire I think, because a lot are solid black in color. What can I use to get them clean? Is there a liquid cleaner that I can submerge them in to let them soak and get clean? Using Awesome Cleaner on ChromeCan you use Awesome on a motorcycle's chrome? Removing a Tarnish Stain from SilverI have used the salt and baking soda cleaning method for cleaning silver. However, many pieces were so tarnished and old that they have what looks like a tarnish stain. I have used commercial products to no avail. Does anyone know something I can try? Cleaning Burned Pots and PansI would like information on cleaning off burnt stains on stainless steal pots and pans after the gunky stuff is off. Removing Tape Residue from Metal SurfacesHow do you take the sticky stuff from tape off metal? Removing Orange Glo on Stainless Steel OvenI just noticed Orange Glo hardwood floor cleaner spots all over the bottom of my stainless steel oven. Vinegar doesn't work! What can I use? Bleach Discolored My Silver BraceletCan you help me please? I dropped my silver bracelet in bleach and it has gone grey. Removing Stains from a Zinc Plated WallPlease advise me on how to remove stubborn stains from a zinc plated wall. Thanks. Removing Welding Burn Marks on Stainless Steel Pipe JointHow do I remove a welding burn mark on a stainless steel pipe? What type of chemical or spray can I use? Cleaning a CoinI have a coin that is tarnished and I would like it to be shiny again. I am not worried about it's value as a collectors item or anything. It's just regular old 50 cent piece that I would like to clean up. Cleaning Brass Plated DoorknobsI plan to clean all of my doorknobs in my house and they are all brass plated. 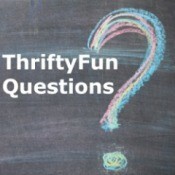 What is the best product or home solution to use? Cleaning CopperI inherited a small copper "tub" that was stored in a barn. It has turned completely black. What is the best way to restore it's copper finish? Also, once it's cleaned, is there anything that can be put on the surface to keep the copper from getting dull? Cleaning Stainless Elevator DoorsI'm looking for the best way to clean stainless steel elevator doors? I am looking for all new tricks of the trade. Cleaning Aluminum CookwareHow does one clean an aluminum baking pan that has baked on oil? Removing Ballpoint Pen from MetalHow do I remove ballpoint ink from metal? Cleaning and Reusing Metal TinsI have metal tins that contain solvent based inks and metallic flakes. I want to clean and reuse these tins. Any ideas? Cleaning a Wrought Iron Basket I have an old wrought iron basket with a handle styled with a most unusual, intricate design. I have flat glass in quarter size pieces in purple, emerald, and teal to fill the basket. I will intertwine the basket throughout with tiny white lights. 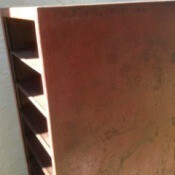 Cleaning Rust Off Of a Metal Box GraterI have a metal box grater that has some rust on it. Can it still be used and if so, how can I clean the rust off of it? Cleaning Brass Stiffel LampsHow do I clean antique Stiffel lamps? Cleaning Corroded PenniesHow do you clean "smooshed" pennies (so they are once again shiny)? 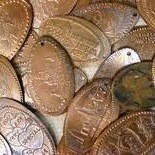 You know the flattened pennies that you buy for 51cents at theme parks, museums, or rest stops, etc.? Removing Rust from BrassI need some suggestions for cleaning rust on a brass ornament. Removing Rust Stains from Aluminum SidingI have a mobile home that has aluminum siding with rust from many years of moisture running down the sides. What is the best way to remove it without causing problems with the paint underneath? Cleaning the Inside of a Burned Copper Tea KettleI burned my copper whistling tea kettle. I can get the outside reasonably clean, but worry about the inside. How do I make sure it's free of nasty stuff inside? Cleaning Silver Oxide PowderI have heard about the silver cleaning method using foil, salt, and baking soda. I have some silver oxide in powder form, will this method work for that? Cleaning an Old Copper Colored SinkI would like to know how to make an old copper colored sink shiny! It is not real copper, is not stainless steel. I do not what it is made of, but it is ugly. I wish there was something I could do to change how it looks and pretty it up. Removing Rust from Cast Iron PanHow do I remove rust from cast iron skillets? Removing Sticker Label Stain on Aluminum JarsHow can I remove sticker label gum stain from aluminum jars? Removing Tarnish from Stainless Steel CutleryI would like to know how to get the bluish "stain" off stainless steel cutlery. It seems to come from the dishwasher. Cleaning Stainless Steel Grill GratesWhat is an easy way to clean my stainless steel cooking grates for my infrared grill? Permanent Marker on MetalMy niece wrote in permanent black marker in the metal facing of the heater. How can I get rid of it? Polishing Silver with Household ProductsWhat is a homemade way to polish a silver dish? How Can I Clean Brass Using Household Products?I am looking for a way to clean brass with household products. Homemade Brass CleanerI am looking for a homemade cleaner for brass. Cleaning Silver With Products at HomeI am looking for home remedies for cleaning silver plated items. Keeping a Metal Loaf Pan from RustingI have a metal loaf pan that has rust on it. If I wash and dry the pan, I can get the rust off. But if I wait a few months before I use it, it is rusty again. Any suggestions for using this pan? Removing Rust from Paper ClipsI found a old box of paper clips. They are a bit tarnished. How do I restore them so I can use them? Removing Sharpie from MetalHow do you remove red Sharpie from a brass doorknob? Cleaning Brass Fireplace DoorsI would like information on cleaning brass fireplace doors that got burned and discolored. Removing Spray Paint from CopperI bought a beautiful copper container at a garage sale and someone has put copper spray paint on the outside. How can I remove the paint without damaging the copper? Tape Residue on ScissorsHow do you clean the residue of double stick tape from scissors? Cleaning a Corroded Salt ShakerHow can I clean a chrome salt shaker that is corroded by salt (green tarnish)? Removing Rust Stains on GunmetalHow can rust stains be removed from gunmetal? Cleaning Aluminum Window FramesHow do you clean aluminum? We have old aluminum window frames in an old house. We are renovating and I would like to clean the window frames. They are looking tired and old and the window runners have mold and a build up of dirt and dust.